Summer may be winding down, but the average temperature in Gainesville is still 90 degrees and cold treats are still on everyone’s mind. 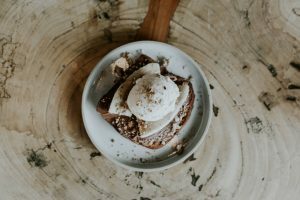 In honor of National Ice Cream Sandwich Day we’ve got three delicious ice cream sandwich recipes that you can make at home! Our first two recipes come from Delish and are the ice cream sandwich twists of the classic breakfast foods, cereal and cinnamon rolls. Our third recipe is a classic ice cream sandwich from Martha Stewart’s website. Whisk butter and sugar together; add in egg, vanilla, and salt; add cocoa and flour until smoothly mixed. Spread in prepared baking pan. Bake until cake is dry to the touch and edges begin to pull away from the sides, 10 to 12 minutes. Cool completely in pan. Unwrap sandwich; using a serrated knife, cut into 8 rectangles, wiping off blade between each cut. Serve ice-cream sandwiches immediately. We hope you enjoy these recipes. If you end up making any of them share pictures with us on our Facebook wall!